Description: Don't catch these out on the road too often! TORC SD40 #999 in the oddball April 1st consist of Q516. 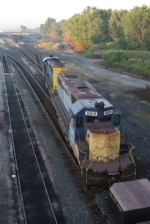 Description: Sitting in the CSX Toledo Docks Yard. Description: The classic feel to these ancient C&O grounds is undeniable. Even the last CSX owned (TORC reporting marks) SD40 graces the scene. Title: Walbridge Switching with TORC. Description: Toledo Ore Dock #999 switching near the hump in Walbridge.